A girl goes to a house party on a regular Friday night. She can’t immediately find her friends, so she pops into the bathroom to check her makeup. 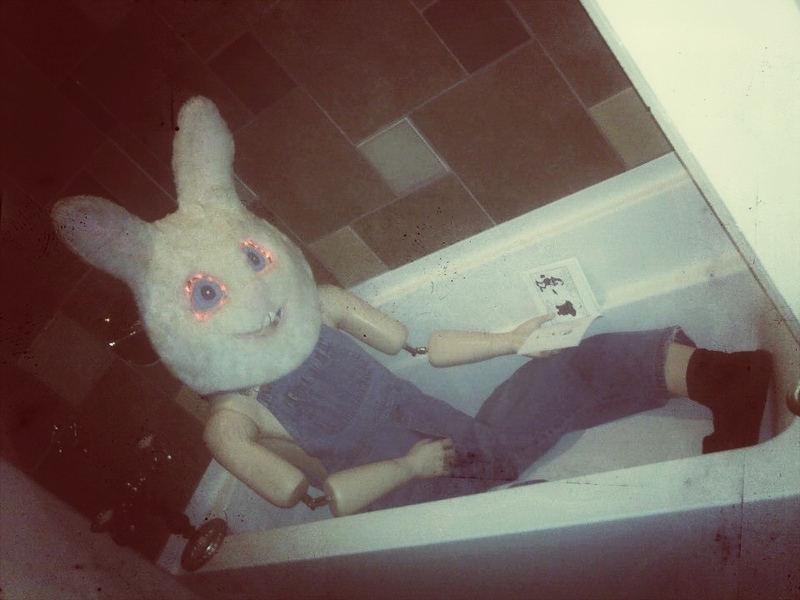 She notices a gnarled mannequin in the bathtub, wearing a smiling bunny head with LED eyes, and figures it’s creepy decoration to spook drunk kids. Snaps a photo and then leaves. Locating her friends, she shows them the picture of what she found in the bathroom, and they all have a laugh except for one of the boys. He falls quiet as he drops his beer. Asking what’s wrong, it takes the kids a few minutes to get the boy to speak. All he tells them is to not use the bathroom for the rest of the night. He leaves the party shortly thereafter. A few hours later, one of the girls from the friend group says she really needs to pee. Everyone laughs and attempts mock concern for her safety in using the restroom that has the bunnyman in the bathtub. One friend jokes he’ll stand guard outside, in case anything happens. They all watch the door close behind her, and immediately resume their conversation. Half an hour later, one of the kids notice their friend isn’t back. The bathroom door is still closed, and there is a significant line of disgruntled looking people. One of the friends bangs on the door, calling the girl's name. It's hard to hear anything above the sounds of the party, so they try the handle. Finding it unlocked, they peek inside. The light is off, except for the bunnyman's LED eyes. Clawing for a light switch, suddenly the overhead bulb flickers. At this point, a crowd has formed, hoping to embarrass the girl who monopolized the bathroom. They find the girl in the bathtub. Her body bent and broken, she is wearing the bunny head. Someone at the party starts screaming. First it just sounds like shrill wailing, but soon everyone hears it, said over and over; "NOT AGAIN. NOT AGAIN. NOT AGAIN." 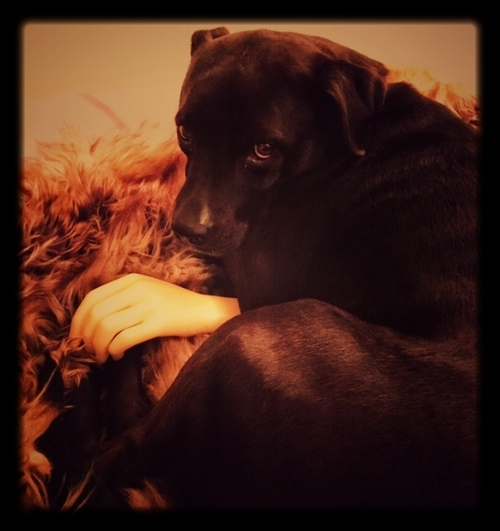 That night, I dreamt my dog tried to open a Kinder toy with what I could only describe as human hands. As I snatched the egg away from her, I was less disturbed by her unlikely appendages, and more concerned with her eating the chocolate. And how the hell did she get hold of a toy that is banned in the states?! Nightmares and mutant dog hands aside, I love a good folktale. Traditional folklore has been reconstituted in the form of urban legends, although I don't feel the terms are completely interchangeable. Our method of communicating these stories quickly and effectively has gained traction thanks to the internet, but I do feel the overall idea remains the same. Some really standout horror comes from these modern cautionary tales of inexplicable things, such as the Bongcheon-Dong Ghost webcomic from 2011. For a quick scare, hop onto the NoSleep subreddit for an immediate influx of Creepypasta. The short stories Candle Cove and No End House were picked up by Syfy for their Channel Zero series, both of which started out on reddit. The main attraction of these stories, at least for me, is they are typically short, punctuated by a strange twist, and / or character that creates an immediate impact. I try to keep this in mind when creating a new monster. All I've got to get my idea across is a visual punch and a title. I have a series in the works, with the aim to create an interesting lore specifically around my donut creatures. Oh, and that bunnyman story? I totally made it up. That image is from a house party I went to in 2012. No idea why he was there, but I've always loved that picture.